There is a useful feature OData notification in C4C which allows any kinds of external applications such as other SAP system or third party applications to hook the create, update and delete of a given business object in C4C. In this blog, I will demonstrate the technical steps needed to monitor the create or update of C4C Opportunity in SAP CRM On-Premise system, that is, whenever a new Opportunity is created or updated in C4C, this change event is logged in SAP CRM accordingly. This might not be a valid case from business perspective, but you could just follow the steps to build your own integration scenario. Create a new Consumer by clicking button Add Row. Suppose system A6P is my CRM On-Premise and client 213 is the client where I expect to monitor the C4C Opportunity creation. Here I specify Consumer Endpoint as https://<crm host name>/sap/bc/bsp/sap/crm?sap-client=213, which means once the ICF service in CRM under path /sap/bc/bsp/sap/crm will be called to log the C4C opportunity creation. I will create the ICF handler for this service in CRM in next step. In Subscription tab, select corresponding Business Object and OData service for Opportunity. Since I am only interested with Create and Update, so mark the first two check-boxes accordingly. 2. 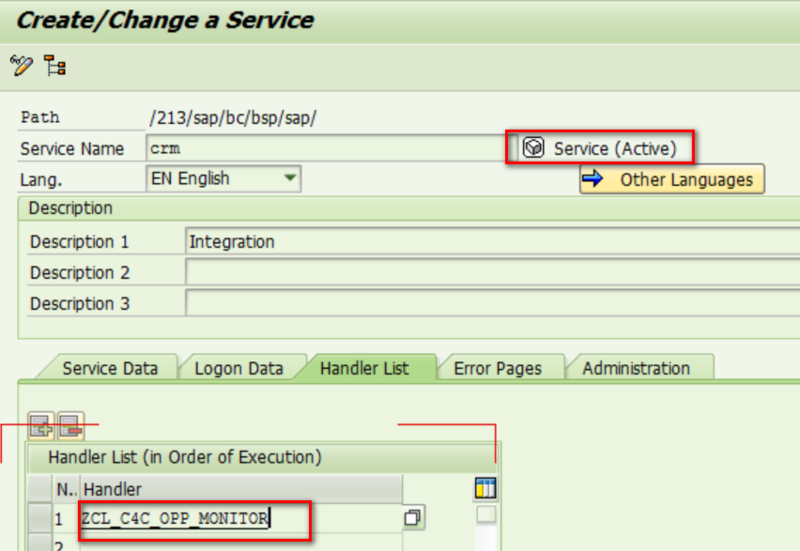 Go to CRM system, create a new ICF service in tcode SICF under path /sap/bc/bsp/sap/crm. Of course you could change the path according to your own requirement. Create a new handler class for this service and activate both. It is ready now to write some real logic in CRM. Paste the following source code and activate the class. READ TABLE lt_node ASSIGNING FIELD-SYMBOL(<event>) WITH KEY attribute = 'event'. READ TABLE lt_node ASSIGNING FIELD-SYMBOL(<opp>) WITH KEY attribute = 'odataServiceEndpoint'. DATA(lv_opp_detail) = zcl_c4c_crm_integration_tool=>get_opp_detail( <opp>-value ). The complete source code could be found from my github. And then the handler method in CRM will automatically be called. Here below is an example of payload sent from C4C system, including BO instance id and change event type. The detail information of changed opportunity could also be retrieved as well. You can find a list of all other blogs related to OData written by Jerry. Thanks for this post. Our client has the requirement of integration between SAP C4C & SAP CPM. The scenario they want is as soon as any opportunity is created a notification with opportunity info. is to be sent to the CPM system. 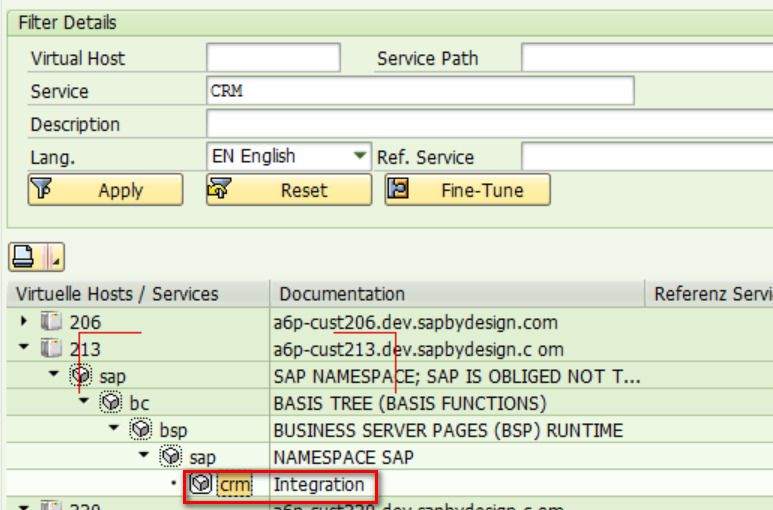 As we have tried doing this but we found that there is no standard integration available for SAP C4C & CRM. Can you please help on this? Awesome Work Jerry. Thank you so much for this great blog. Will the process be same for ERP ? Especially the step 2 of SICF ?